Flightless and fearless, the sandy-brown Laysan Rail was swift and curious. It darted over the sand from one patch of grass to another or crept gingerly through the tall grass, poking its head inquisitively (Brief Eulogies p. 44). Two Roads is pleased to be the recipient of a 2018 grant from the Medford Arts Council to develop our new work entitled “Mirabilis: Stories of Wonder and Loss” based on Daniel Hudon’s book Brief Eulogies for Lost Animals and personal stories of wonder. 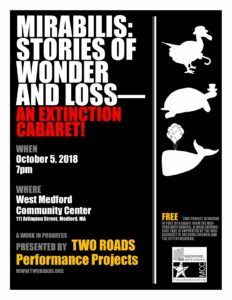 A free public work-in-progress showing will be on October 5, 2018 at the West Medford Community Center at 7 PM. Email: tworoads.org@gmail.com for more information. This program is supported in part by a grant from the Medford Arts Council, a local commission that is supported by the Massachusetts Cultural Council and the City of Medford. We also thank the West Medford Community Center for their support. Have you seen the video of the last thylacine? (Brief Eulogies p. 84). Two Roads Performance Projects is located in Medford and was founded by Wanda Strukus and Kyna Hamill to produce the award-winning Dance in the Fells in 2010. Two Roads continues to support the creation of public art as well as site-specific and historically and environmentally based performance. Collectively, Kyna and Wanda have produced, created, and facilitated over 50 theater, dance and movement-based productions.